Related to this anniversary, today’s also the day “Action Comics” #1000 comes out, which DC’s been promoting heavily. “Action” is the highest-numbered currently-published comic published by an American comic publisher. Of course, it’s not the highest-numbered American comic ever—that’d be Dell’s “Four Color Comics” series of the 1940s-1960s. As I’ve already written general Superman anniversary-related stuff for the Man of Steel’s 75th anniversary five years ago, I won’t repeat that here. 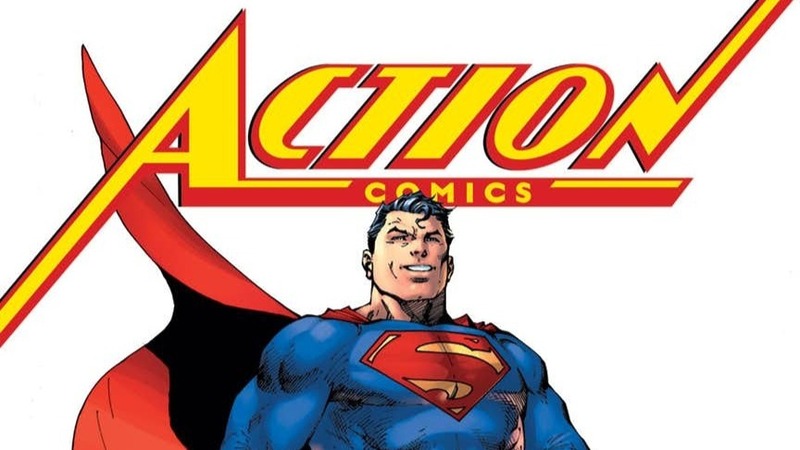 Instead, I’ll look at some of my favorite or noteworthy issues of “Action.” Some of this is taken from my previous post about “Action Comics”‘s 900th anniversary issue. “Action Comics” #252 (May 1959). Art by Curt Swan. Plot: The first appearance of Supergirl, Superman’s cousin, who lands on Earth. Supergirl marked a pretty big shake-up for Superman’s status quo. One way is in the explanation for Kryptonian powers: Supergirl’s backstory (coming from a fragment of Krypton that survived the explosion) made clear “low gravity” (the Golden and early Silver Age explanation) alone didn’t cut it. Thus, “Action Comics” #262 (March 1960) introduced a new explanation: the rays (or “ultra solar rays” as the story put it) of a yellow sun like Earth’s are the source of Kryptonian superpowers. As such, the yellow sun explanation has stood to this day. It also gave Superman a new weakness: no powers under a red sun. Plot: Superman is tricked by the Superman Revenge Squad into traveling a million years into the future. There, Earth’s sun has turned red, rendering Superman powerless and stranded on an Earth without anyone left. This one’s one of the all-time classic Silver Age Superman stories, complete with a distinctive cover. “Action Comics” #484 (June 1978). Art by Jose Luis Garcia-Lopez. Plot: This 40th anniversary issue was published, well, 40 years ago. 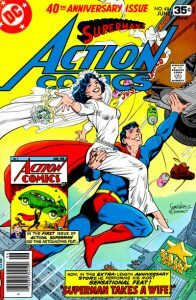 It’s a landmark issue, as it features the first canonical marriage for Superman and Lois Lane. Or at least, their Golden Age/Earth-2 counterparts, as the cover indicates. This issue was followed up by a series of backup stories (titled “Mr. and Mrs. Superman”) that delved more into the early days of the Kents’ marriage. Plot: Superman recounts his life story at the Metropolis World’s Fair while Luthor uses the occasion to hatch his latest scheme. This anniversary issue retells the Silver/Bronze Age (or Earth-1) version of Superman’s life story. Of course, there’s later series that added to this issue’s account, including the 80s Superboy series and the “World of Krypton”/”Phantom Zone” miniseries. Plot: Lex Luthor’s plans to destroy Metropolis come to a climax, as he, well, destroys Metropolis. This one was a part of the “Fall of Metropolis” storyline. I recall buying this particular book at the store, with the cover standing out. 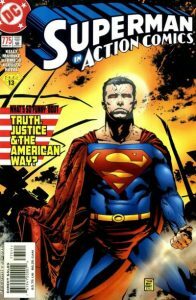 “Action Comics” #775 (March 2001). Art by Tim Bradstreet. Plot: A new group of superhumans (called “The Elite”) with more violent solutions to problems emerge. The Elite claim that Superman’s crime-fighting methods are “old-fashioned” and “too soft” on criminals. As such, Superman’s forced to figure out how to demonstrate to the Elite why his ways work. This one’s become a popular modern-era story, with several reprintings. It addresses how Superman works in an era of darker, more cynical superheroes (or anti-heroes). #23 (April 1940): the first appearance of Lex Luthor. #241 (June 1958): the first appearance of the classic Fortress of Solitude. #242 (July 1958): the first appearance of Brainiac. #262 (April 1960): the first appearance of Bizarro World. 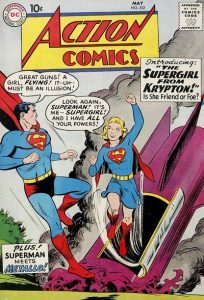 #285 (January 1962): Supergirl makes her public debut (after operating in secret for three years). #340 (August 1966): the first appearance of the Parasite. #521 (July 1981): the first appearance of Vixen. #583 (September 1986): the second and last part of “Whatever Happened to the Man of Tomorrow?,” the farewell issue to the pre-Crisis Superman mythos. #662 (February 1991): Clark Kent finally (and canonically) reveals his dual identity to Lois Lane, after proposing marriage.